The first questions asked by most of our new carpet cleaning customers are "How long does it take to dry?" and "Does it remove all the stains?" Both questions are impossible to answer. A carpet pile made from wool will take longer to dry than a carpet pile made from a synthetic fibre. A soft drink stain that occurred yesterday will be more likely to lift than a coffee stain that is a year old. What we can say though is that our drying times are measured in just a few hours and that there are very few stains that defeat us. 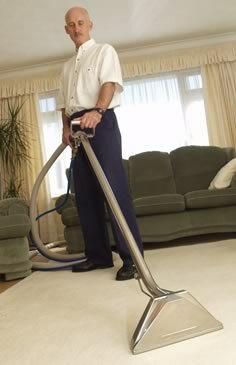 The main method of carpet cleaning that we employ is hot water extraction (sometimes called steam clean). The area to be cleaned is first treated with an appropriate pre-spray cleaning agent and then thoroughly rinsed with the Extraction Machine, leaving your carpet clean and fresh. Our machinery is an up to date truck mounted unit which is both quiet and very powerful, with no noisy machine in your home.